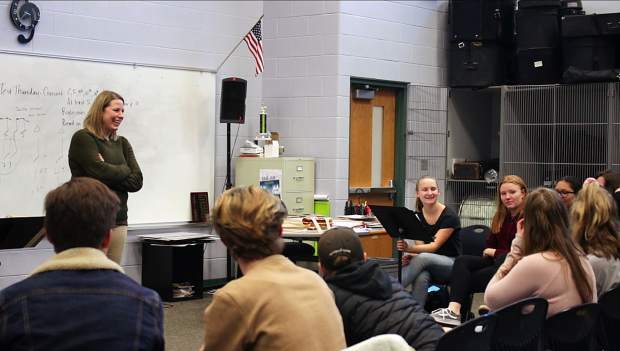 Roaring Fork High School and Carbondale Middle School choir and drama teacher Marcia Kuhlman leads chamber choir rehearsal at RFHS last week. 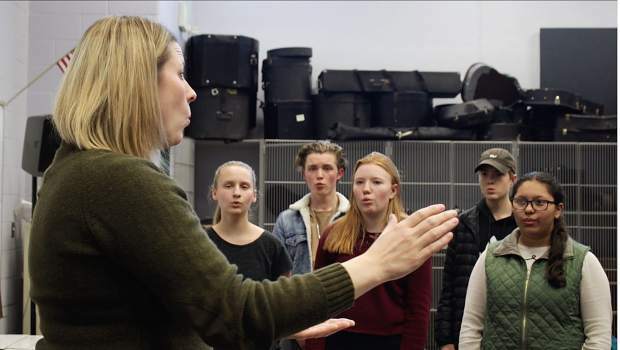 In less than two years as a teacher in the valley, Marcia Kuhlman has restarted the dormant choir program at Roaring Fork High School and formed a choir at Carbondale Middle School for the first time. And she’s a part-time employee. Kuhlman organized a holiday choir concert Dec. 11 for the second year in a row, with students from both schools and special performers from the community. The event packed The Orchard with standing room only. Kuhlman’s choir, drama and guitar classes join an already robust offering of creative activities at RFHS. The visual arts program is strong, as is the band and a jazz program. But having the choir helps to engage more students in nonacademic pursuits. In a year and a half, the choir and drama program at RFHS has grown quickly. 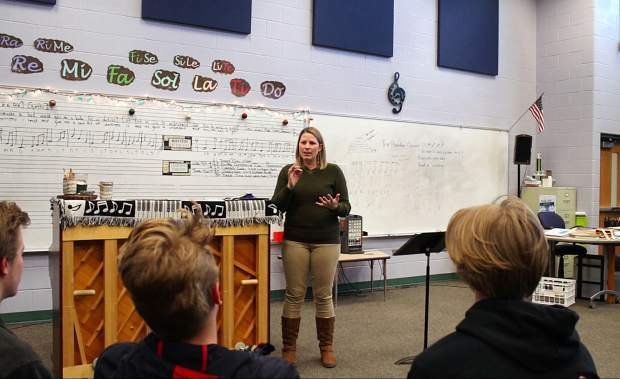 Kuhlman, who lives in Glenwood Springs with her husband, started teaching choirs for five men and 19 women during lunch last year. This fall, she had 23 students in women’s choir, five in the men’s group, and a chamber choir of 16. The choir at CMS fluctuates between 45 and 50 students. 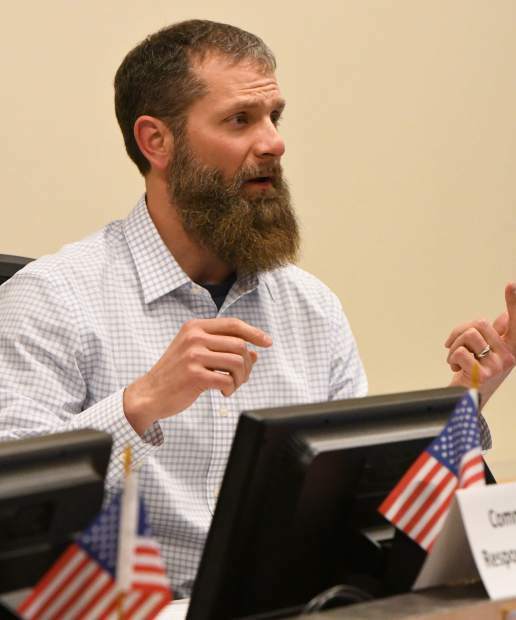 “I had never wanted to teach middle school,” Kuhlman said. She has a master’s in choral conducting, and has taught private vocal lessons since she was in high school. But it never appealed to her to teach younger students. She cringes as she remembers one of her young students hugging her with an open pudding cup recently. Kuhlman realized that if she wanted high school freshmen to have choir experience, she would have to build the middle school choir herself. Basalt High School’s choir teacher also runs a middle school vocal program. As a feeder to the high school choir, Kuhlman knows the stress of balancing two different school schedules will pay off, and she’s truly enjoyed the experience of teaching the younger kids. It didn’t take long for the middle school students to engage and enjoy the choir, said senior Patrick Keleher, who also helps as Kuhlman’s teacher’s assistant at the middle school. “There’s been a difference from the first day, when nobody took it seriously, to now, when there’s a lot of respect and focus” at the middle school choir, Keleher said. 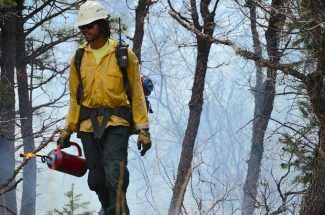 “The first couple weeks were definitely stressful with 50 kids running around,” Kuhlman said. The fifth-graders wanted to play in the curtains, and the eighth-graders would roll their eyes. The two choirs brought together sisters in one family to pursue vocal music. “My sister is in the CMS choir,” sophomore Izzy Knaus said. “She’s never sung before, but she’s always loved it. Now, she has an outlet,” Knaus said. Part of Kuhlman’s success teaching both the middle and high school choirs is her “perfectionism and attention to detail,” Knaus said. “I think it wears off on all of us, and we are determined to be the best we can,” she said. “Stars Over Snow,” an a cappella piece featured in the Holiday Harmonies concert, represents how the chamber choir has grown musically, according to members of the ensemble. “We learned a lot from that song — more than any other song,” Keleher said. Some of the high school choir members are used to singing. Several of the men play and sing in bands, and have strong voices, Kuhlman said. But the women have outpaced the men in learning to read music, she said. “I didn’t know you could learn so well,” Kuhlman remembers saying. Like any choral director, Kuhlman stresses proper technique in approaching vowels and breathing. 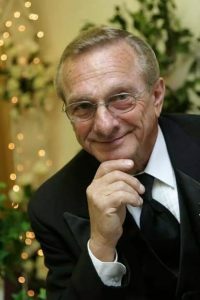 Many of the students also take private voice lessons from Kuhlman. 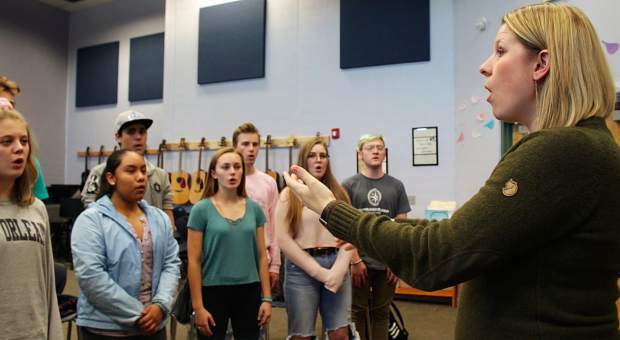 “She’s helped me build my voice up so it’s not just, ‘Oh, I can sing pop songs like any other person.’ Now it’s, ‘Oh, I can sing in Italian,” sophomore Ayden Richmond said. The chamber choir has learned songs in a number of languages, including Hebrew, Portuguese and Latin. Carbondale is known as a welcoming place where artists can access a multitude of resources to pursue their creative aspirations. But at a small high school of less than 500 students, funding arts programs is a challenge, Stringer said. “More than a third of our students are involved in a sport, so [the arts and clubs] help to reach the other two-thirds,” Stringer said. 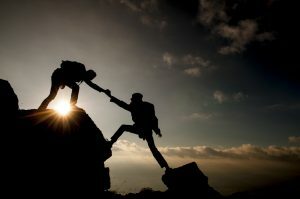 Reaching students is important for Kuhlman as well.